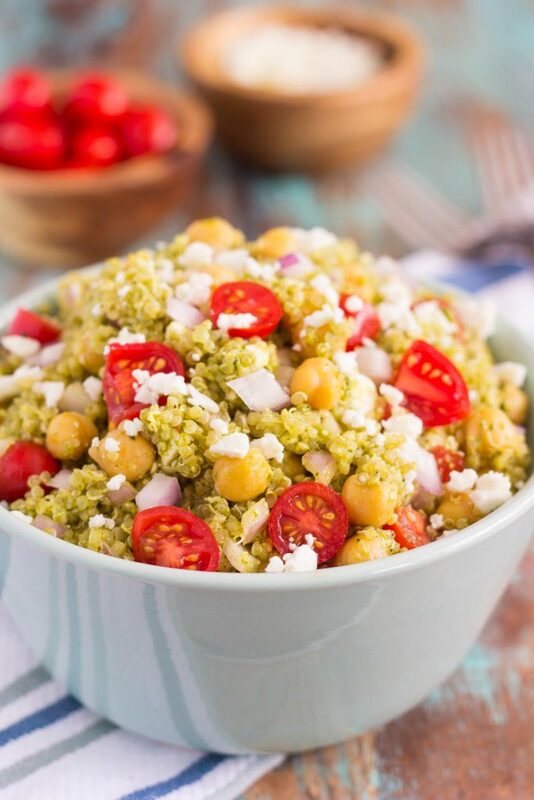 This Quinoa and Chickpea Pesto Salad is filled with chickpeas, hearty quinoa, cherry tomatoes, red onions, and crumbled feta cheese. It’s tossed with a zesty pesto sauce that packs a punch of flavor in every bite. It’s easy to prepare and makes simple dish that’s perfect for lunch or dinner! Quinoa, chickpeas, and spring kinda just go together, don’t ya think? I’ve mentioned this before, but I never tried quinoa or chickpeas until about three years ago. I often seem to be behind on the newest food trends, so those took a back seat for a while. Along with hummus, which luckily, I discovered a few years ago and am now addicted to…but that’s another story! Once I tried these two foods, I was hooked. I whipped up these quinoa bowls, that salad, and this tasty dish. I was buying chickpeas like crazy, roasting them, and tossing them into whatever dish I happened to whip up. But, unfortunately, it’s been a while since I’ve combined the two. So to make up for the absence, I thought I would put a whole new twist on quinoa and chickpeas by adding in some pesto. Remember when I made my own Basil Pesto last week? Well, I’ve been craving it non-stop and adding it to pretty much anything and everything. And that’s where this Quinoa and Chickpea Pesto Salad comes into play. 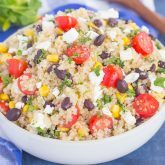 This salad is filled with chickpeas, hearty quinoa, cherry tomatoes, red onions, and crumbled feta cheese. 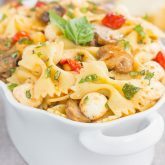 It’s tossed with a zesty pesto sauce that packs a punch of flavor in every bite. It’s easy to prepare and makes simple dish that’s perfect for lunch or dinner! And let me tell you, this salad is definitely not lacking in flavor! The tang from the red onions, the creaminess of the feta, and the basil pesto provides such a delicious combo. It’s light, simple, and refreshing for a spring-time dish. If you love pesto as much as I do, then this salad is calling your name. And you really can’t get much easier than this! The most time consuming part of this Quinoa and Chickpea Pesto Salad is cooking the quinoa. But, really, it’s just boiling some water (or chicken broth for more flavor) and cooking until the quinoa absorbs all of the liquid. Then, you simply toss the cooked quinoa, chickpeas, red onion, tomatoes, and feta in a bowl. Add some of this Basil Pesto Sauce, or use a store-bought version for convenience, and stir to combine. And that’s it! I told you it was easy peasy (and SO delish)! 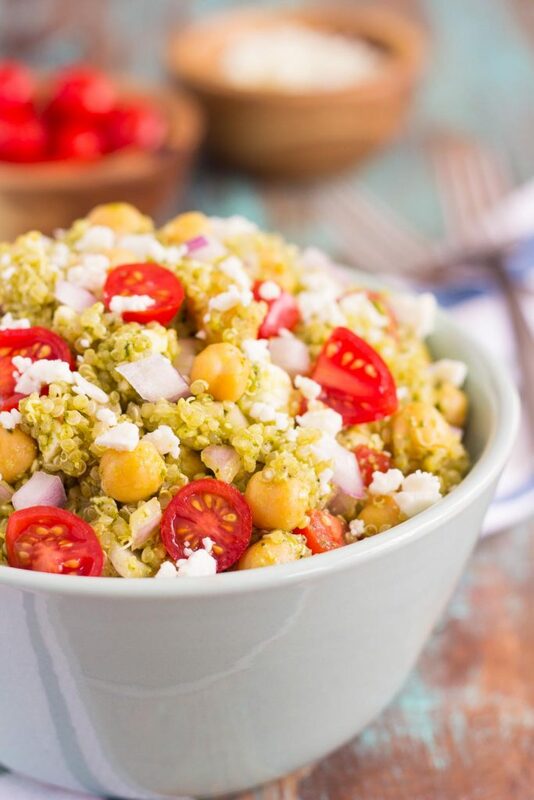 So the next time you’re in the mood for a lighter salad, grab those chickpeas, cook that quinoa and whip up this flavorful Quinoa and Chickpea Pesto Salad! Perfect for parties, get-togethers, or just for a light meal, you’ll be making this over and over again! Looking for more easy salad recipes? I’ve got you covered! 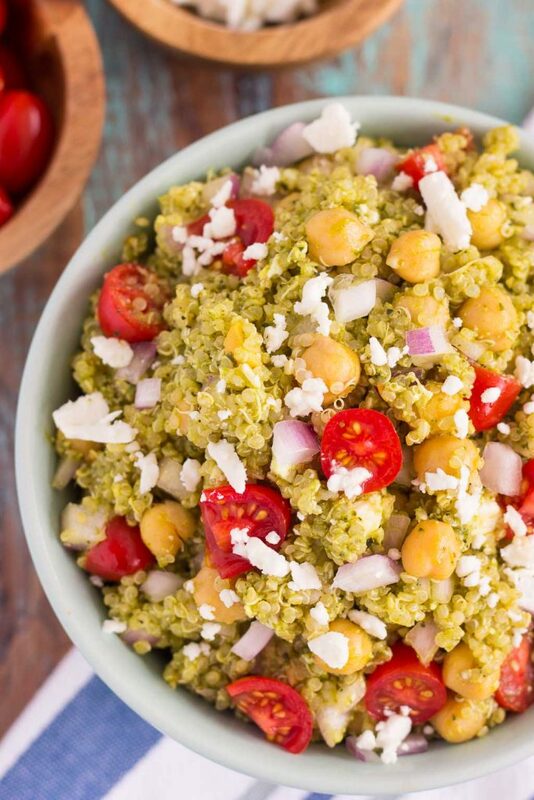 This Quinoa and Chickpea Pesto Salad is filled with chickpeas, hearty quinoa, cherry tomatoes, red onions, and crumbled feta cheese. It's tossed with a zesty pesto sauce that packs a punch of flavor in every bite. It's easy to prepare and makes simple dish that's perfect for lunch or dinner! Once quinoa is prepared, pour into a medium bowl. Add chickpeas, tomatoes, red onion, feta, and pesto. Stir to combine. I love how you incorporate feta so well into so many of your dishes. I'm also a huge feta nut, so it gives me ideas for how to use one of my fave cheeses! And this is a perfect use for that incredible pesto! Thank you, Mir! Feta is one of my favorites! Yep, love pesto! Plus, I'm always looking for new ways to enjoy quinoa. Perfect! Thanks for the salad love, Dawn! Gayle, I was the same way when I first starting making pesto at home .. putting it and mixing it into everything! 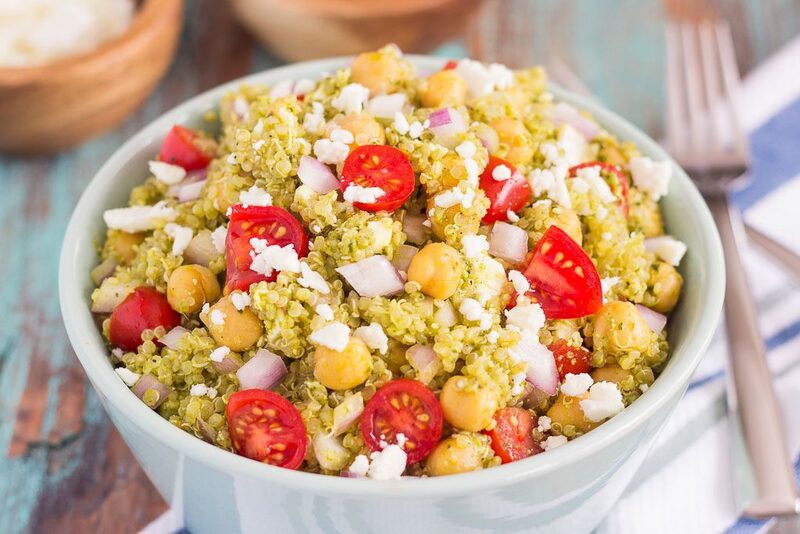 I love this Quinoa and Chickpea Pesto Salad!! LOVE the crumbled feta cheese, what a great add!!! and looks so good! Thank you, Alice! I just can't get enough of homemade pesto! Yum! I love making easy salads with quinoa and chickpeas, but I've never thought to add pesto. That is such a great idea! This looks so delicious, especially with the extra pops of flavor from the feta and onion! Thank you, Kristine! I'm now hooked on quinoa with pesto...it's such a delicious combo! Thank you, Demeter! That's true...food trends definitely don't matter, as long as the food is good! Happy Monday to you, too! We're definitely quinoa salad twins today! This is definitely perfect for spring and summer and you can never bean chickpeas and pesto sauce in my book! I love eating salads like this for lunch -- this looks perfect! Quinoa, pesto, chickpeas? These are seriously some of my all time favorite ingredients to work with- loving this! Haha! I am TOTALLY even farther behind on food trends. Mostly because I'm a chicken when it comes to trying new things. This is the perfect summer salad! I love the flavor the pesto and tomatoes would give! I 100% agree that quinoa and chickpeas go with spring.. especially when you add pesto and cherry tomatoes!! This dish looks delicious Gayle! Full of fresh flavor, light yet substantial and filling! Perfect for spring, especially when I'm trying to get back into bathing suit shape!! ;) Pinned!! Cheers, friend! Thanks, Cheyanne! This is my favorite salad! Love both quinoa and chickpeas and the combination with pesto sounds awesome! So fresh and delicious! Pinning! Thanks for the quinoa love and pin, friend! I love learning new ways to incorporate quinoa into a meal. This salad looks and sounds so tasty. The pesto is a nice addition for fresh spring flavor! Thanks, Jen! 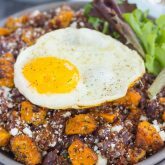 I love finding new ways to use quinoa! You are speaking my language with this one! I'm always in the mood for basil pesto but for some reason lately, I've really been craving quinoa! This salad is all sorts of fresh and delicious!! Sounds like this is the perfect combo for you, Annie! Thank you! 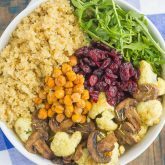 I'm a huge quinoa fan AND chickpea fan so completely in love with this recipe! Also, such beautiful pictures Gayle! Thanks so much for the kind words, Jessica! Thank you, Cyndi! Quinoa is pretty bland by itself, but I love jazzing it up, especially with pesto! packed with flavors, wish this was my lunch!! Chickpeas are a total staple at our house! I eat a ridiculous amount every week! lol This salad has my name all over it - love the tomatoes and the pesto! Thanks for the salad love, Shelby! What a great way to use that basil pesto. Now that I think about it I'm pretty sure I've only used quinoa to make porridge. It's always been sweet and eaten at breakfast. I need to expand my horizons because I'm pretty sure I could just eat a nice portion of this and make it my lunch. Looks great! I've only used quinoa once in a sweeter dish, though that's a great way to use it, too! Thanks, Amanda! What a flavorful and creative dish, Gayle! I love pesto and have never tried it with quinoa. That feta is a nice addition too! This looks like such a filling and flavorful salad. I just want to take a bite right now!